I found a tutorial on how to print with a rolling pin. I couldn’t try it yet, but when I will, I want to try it with those ready-bought fun foam shapes. I already presented the Rice Glue, here is an instruction for making flour glue. It seems that it can be used very good for paper or cardboard and if you increase the amount of the ingredients (and add a little turpentine) it seems that you even get wallpaper glue. What I really appreciate is, that those glues are non-toxic, that I don’t have to buy stuff to make them and that the making doesn’t seem to be too tedious. 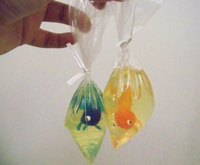 You see soaps on the photo, aren’t they stunning? I have never poured soaps until now and actually I don’t want to try it (I think that it is muuuch fun, but I simply don’t know anymore where to put my stuff ;-)). At the moment I’m crocheting a lot and when crocheting, I prefer to make those previously mentioned medaillons that I must join. Because I don’t like to sew them together afterwards I’m joining them while crocheting (see links below). First thing I like about is that I don’t have to sew ;-)) and second that I can watch the item grow. 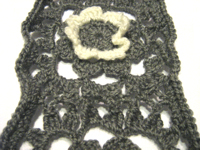 Addendum of February 2009: The link above doesn’t work anymore, you can find the instruction for the ‘Flat Braid Square Joining Method’ now as PDF (about 1 MB) at Priscilla’s Crochet – Free Pattern Index, check there for ‘Afghan Edgings & Joinings’. KreativMonster was so kind to award me with the Award I love your blog. I’m so sorry that it took so long to thank you. Just as Cora I have the problem not to know, which blog to award further: I love every blog and website I’m presenting here (included Coras (KreativMonsters) blog :)).